I have mentioned before that I have an unhealthy obsession with self-help style nonfiction books...and right now I have author Gretchen Rubin on my mind. I'm pretty sure I'm driving my office mate (lady-who-sits-behind-me-all-day-in our-tiny-clutter-filled-office doesn't sound quite as good) batty with my meandering happiness and habits conversations during our workday, but I love listening to her podcasts when I'm at work! If you're unfamiliar with her, let me introduce the two of you. 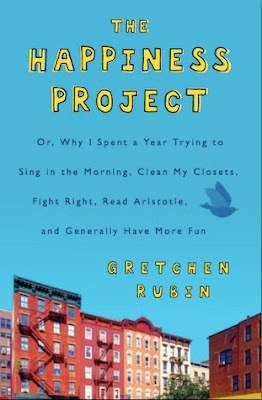 The Happiness Project was the first book of Gretchen Rubin's that I read. It was published in 2009 but I didn't stumble upon it until 2014. Yes, it is one of those "spend a year doing something, then write about it" books, but I've told y'all before that I don't mind that genre. Shoot, sometimes I can't make myself wake up at the same time two days in a row, so if you can manage to work on a project for a significant enough time to write on it, kudos gold-star and a high five from me! But if you don't agree...skip this one. Gretchen spends each month of the year focusing on a particular "theme" that in her eyes might help to make her happier. I wouldn't call her an unhappy person, but like me...someone who spends a lot of time thinking of things she could do to improve. The big difference between me and Gretchen is she actually does them :) I have a very chronic follow through issue. Her months are broken down into things like organizing, marriage, friendship, play etc. These are all things that with one variation or another we could all improve on in our lives. I really enjoyed them, and came up with a ton of ideas to try and implement in my own life. As a matter of fact, I plan on doing a quick re-read soon. The second book by Gretchen Rubin that I read was Better Than Before, which was published in 2015. I nabbed this one as soon as it showed up at my library. This book is all about habits...how you form them, what makes a good one, how different people need to use different tactics to create new habits, etc. I already told you that I have a yearning to improve myself. There are things I like about myself, and things I don't...and I'd like to make one list a little longer than the other. 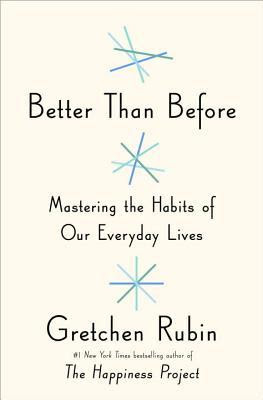 This book has really made me think about the reasons previous attempts at habit building haven't worked so well. It is filled with research and background into good and bad habits, but it is also chock full of actual tips. Sometimes you pick up a nonfiction book on a subject you are dying to apply to real life, and it doesn't actually have concrete information on the HOW. I am always looking for the how. Oh you changed your life around completely...HOW did you do it? This book has the how. Which brings me to the podcasts that she does with her sister Elizabeth Craft. They are called Happier with Gretchen Rubin and can be found on their website, Itunes, or any of the many podcast apps that are floating around. They are really a combo of her Happiness projects, and her Habits projects. They are filled with reader questions, tips, guest interviews and all sorts of practical information. Anytime I'm doing a mundane task at work...something that is just tedious and doesn't require a lot of brain power...I put on these podcasts. And I am actually retaining most of what I'm hearing...which is amazing! Enough sticks in my brain to harass the office mate with (sorry Alicia). 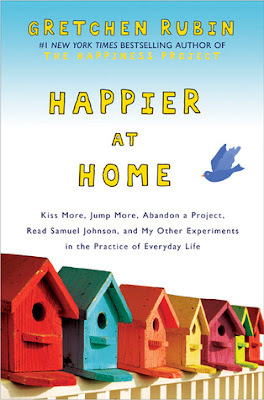 The only one of her recent books that I haven't read yet is Happier at Home, published in 2012...but it is currently sitting on my dresser to read, and I am sure I will like it as much as the other two. I'll also continue to watch her live videos on Facebook...and like her tweets. So, have you read any of these? Listened to her podcast? How do you feel about "Year" books? Any favorite "Self Help" books you think I might like? Leave me a comment here, or over on my Facebook page.